Directions: Take one packet up to two (2) time a day. A great way to get your vitamin c. Tasty and much more fun than swallowing tablets or pills. Not crazy for the other flavours. Didn't expect this one to be good either but went with the reviews. I love coconuts & pinacoladas so I had to try it. The coconut pineapple is by far the best, I love it and will buy it again. Not too keen on the flavour. Prefer orange. Other than that I like the product. Delicious! 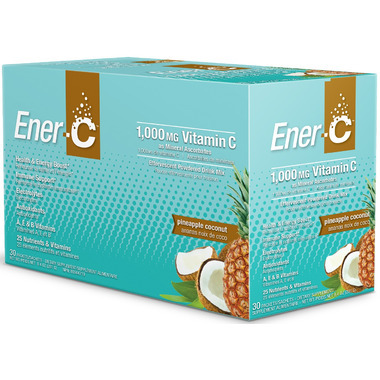 Our family favourite flavour of the Ener-C supplement line, and we love that it's non-GMO and Canadian made. We mix 2 packets per 500 ml of spring water. We use the mix at home, or as hydration during our workouts. Already repurchased. Definetly worth purchasing! Good taste, and good results. I love it ....... a bit expensive but worth buying ! Its good .......... a bit expensive ! This is the only flavour of this brand of vitamin C drink that I really really like. The others are just okay, and some are not good at all. But this one is quite tasty, and worth purchasing.